In this adventure series, a man comes up with a crazy plan to free his wrongfully-convicted brother from prison. He'll get himself locked up, too, and then come up with a plot to break both of them out. It's so crazy, it just might work. Wentworth Miller stars in this series, which debuted on Fox in 2005 and ended in 2017. Michael, Whip and Ja make a last ditch effort to break from Ogygia, but in doing so must make a deal with the devil. Lincoln is desperate to help with the escape, as T-Bag meets with Kellerman to gather more info on Michael's resurrection. T-Bag warns Sara that two of Poseidon’s henchmen, Van Gogh and A&W, may be following her. Lincoln attempts to retrieve his confiscated passport to escape Yemen and Michael plots his next move. Michael makes one final attempt to get Scylla and destroy the Company. Pandemonium erupts at the hotel following the assassination, and Christina puts the final pieces of her plan together. Meanwhile, the General makes good on his threat, and Michael is forced to choose between saving either Lincoln or Sara. A wary Michael meets with Christina. Michael and Lincoln square-off over Scylla as Christina orders a kill shot and set sets her plan in motion. Sarah receives some unexpected news, T-Bag causes a scene at the Indian Embassy and Pad Man's paranoia leads to a death. Michael and Sara make a dangerous hitchhiking journey to Miami while Lincoln meets with his mother and T-Bag and Self's mission to locate Scylla takes a dramatic turn. Michael and Lincoln work to get Scylla back from Gretchen and her new partner. Meanwhile, Mahone meets up with an old colleague, and T-Bag is put to the test. It's up to Michael to hold the gang together after they find out they were betrayed by one of their own. Meanwhile, Gretchen is blackmailed by T-Bag's new partner. As the search for Scylla comes to a surprising end, Sarah takes a hostage, T-Bag and Gretchen have their last stand at Gate, and Michael and Lincoln are betrayed by one of their own as they finally get to go face-to-face with the General. Michael risks his life by breaking into the Company headquarters with Sucre's help. Gretchen tries to get the last card key with a meeting with the general. Michael, Lincoln, Sucre and Bellick tunnel into the Company's headquarters. Gretchen meets with Pad Man. Michael's condition continues to deteriorate.The police question T-Bag regarding Andy's disappearance. Wyatt propositions Sara while Mahone awaits his shot at his son's killer. Lincoln and Sucre target Pad Man to obtain the sixth and final card key, and Gretchen gives Sarah an opportunity to settle the score. Michael and Roland each make deals with different devils, while a team member finds himself on the wrong end of a bullet. Michael and the team tracks a key card holder to a racetrack; Mahone gets caught with something priceless; Wyatt targets Agent Self; T-Bag starts to figure out Whistler's code. Michael and Lincoln make their way to the Treasury Department in search of the next key card holder; an awkward alliance formed by T-Bag at his new job arouses the suspicions of Sucre and Bellick; Wyatt uses his magic touch on Gretchen. Michael and the team have one day to find the next cardholder or they risk going back to prison. Mahone seeks revenge on Wyatt who is attempting to extract info on Sara's whereabouts, while T-Bag finds the gateway to his new identity and future. Michael, Lincoln, Sara and the team work with Roland, a new team meber, to get a copy of the data card. Meanwhile, Wyatt continues his mission to track down the brothers while T-Bag makes his way north using the bird book as his guide. The series' revival starts off with more questions than answers. 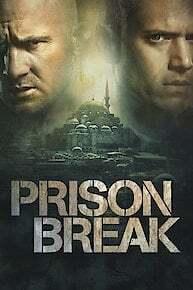 Prison Break is currently available to watch and stream on FOX. You can also buy, rent Prison Break on demand at Amazon, Hulu, Vudu, FandangoNow, Google Play, iTunes online.